Those who seek to rationalize the bare-knuckled kind of apartheid schooling found in the corporate charter reform schools like KIPP often point to the test prep chain gangs' laser focus on getting black and brown children into and through college. If these kids get to college, the thought disorder goes, then all the dehumanizing treatment and abuse of disadvantaged minority children by charter operators must be worth the price. Even so, we have known for years that black and brown college graduates have less opportunity compared to their white counterparts. 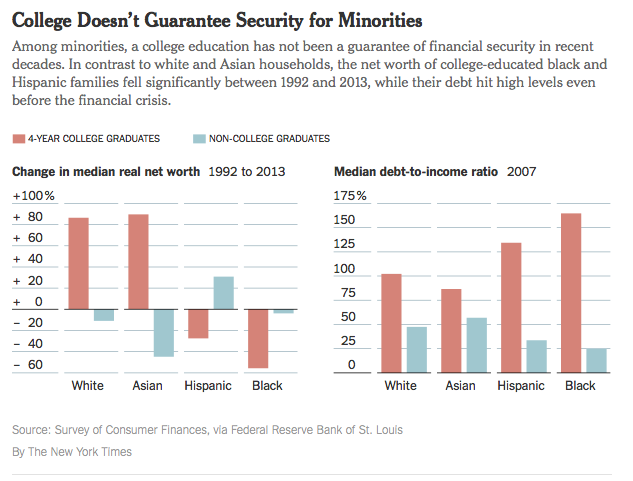 A new study now shows how much minority college graduates are shortchanged in terms of opportunity, while at the same time acquiring massive and disproportionate debt. From 1992 to 2013, the median net worth of blacks who finished college dropped nearly 56 percent (adjusted for inflation). By comparison, the median net worth of whites with college degrees rose about 86 percent over the same period, which included three recessions — including the severe downturn of 2007 through 2009, with its devastating effect on home prices in many parts of the country. Asian graduates did even better, gaining nearly 90 percent. Will these findings alter the Gates and Lumina fixation on college degrees of any kind as the solution to inequity and inequality? Don't hold your breath.